Last week Revolut announced they have reached Unicorn status with a $1.7bn dollar valuation. They have now joined the ranks of Transferwise as one of the fastest growing international payments companies and Finablr (the newly combined UAE Exchange & Travelex) in the billion dollar club. We want to ask two big questions: 1) How far along the growth journey are these Unicorns? 2) Who might be the next? It’s important to keep company values in perspective. 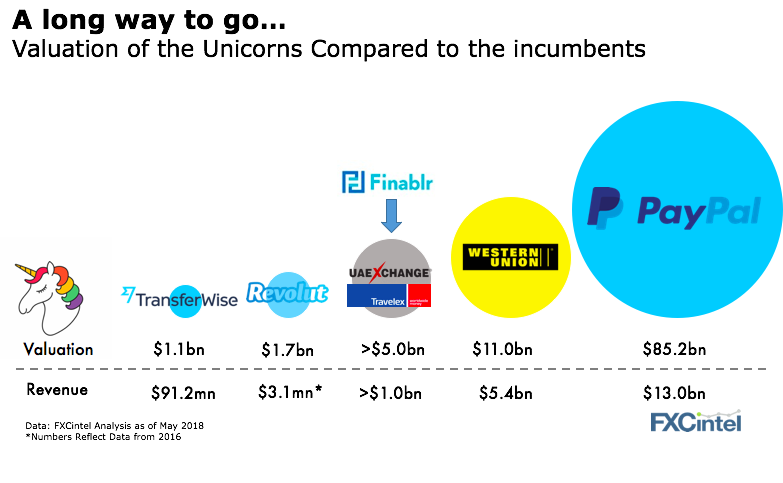 Unicorn status may be great for PR, but compared to PayPal – the most valuable payments company- or even the banks, Transferwise and Revolut are still very small. Additionally, it is clear that no one is going to breach the $10bn and upwards valuations without having either a broader product set or a highly dominant product. Transferwise and Revolut both have started their product extensions with Transferwise focusing on reaching businesses and its multi-currency offering, Revolut by offering a broad set of consumer products, letting users hold crypto currencies, and taking on smaller domestic payments (PayPal’s core product). Finablr’s UAE Exchange (whilst not technically a tech Unicorn) holds by far the dominant remittance position in the Middle East market and this week, it reportedly hired advisors to file for an IPO (our IPO analysis of the market is here). It is no surprise that the two Unicorns in the space focus on serving consumers (as do Finablr and Western Union). When it comes to building a financial services company, to grow at exponential rates, you require a brand and product virility (i.e., a product whose marketing is done for you by customer referrals). Both Revolut and TransferWise are a long way ahead on these two factors. Revolut for example does not even have an affiliate program as it doesn’t need one. We are yet to see a B2B Unicorn in the cross-border payment space. As customer acquisition is done typically customer by customer, exponential growth simply isn’t possible. That means valuations that imply continued exponential growth won’t happen either. Therefore, in order to be valued at Unicorn status, a B2B focused company needs scale in their business, not simply growth potential. A B2B Unicorn is going to come from fast (not exponential) growth and quite possibly via acquisitions. In the e-commerce space, both Payoneer which has raised $270m and WorldFirst who are backed by private equity have the most chance to achieve Unicorn status. Valuations for payment companies are different to ecommerce payment companies and are different to banks so positioning of the businesses is key. 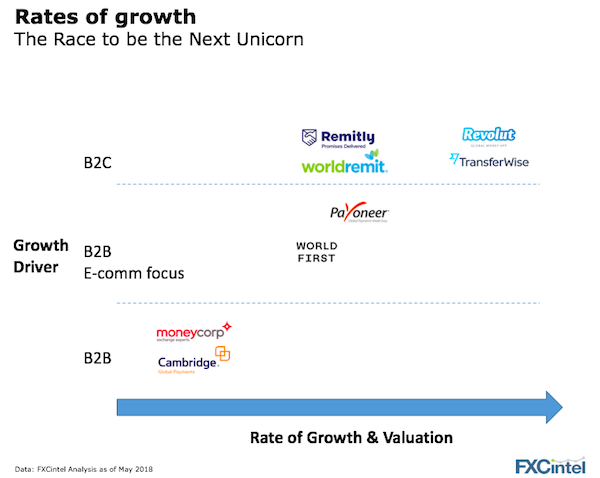 On the B2C side, only a handful of players have raised the nine figure amounts of money needed to build their brands (Remitly and WorldRemit) but none have a product as virally strong as Transferwise or Revolut. That just means more marketing dollars are needed meaning lower margins and lower valuations.